One of the biggest aspects of self publishing that sets it apart from traditional book publishing is the fact that with self-publishing you remain in control. The best self publishing companies -- like MindStir Media, for instance -- allow you to have creative control over your final product. This means you call the shots with respect to your book cover design as well as your interior book design. It also means that the content of your book, the actual text, will remain intact and unchanged. Many traditionally published authors will tell you that they dislike how traditional publishers, particularly the editors, ultimately decide which text will stay and which text will go. As an author myself I can tell you that I would never want to be overruled by an editor. It's one thing to receive professional suggestions from an editor; it's another thing entirely to be controlled by an editor. With professional editing via self publishing services the author will usually see track changes and get to approve or reject the editor's changes. The control is still with you the author! Another huge difference between traditional publishing and self-publishing is the speed to market. 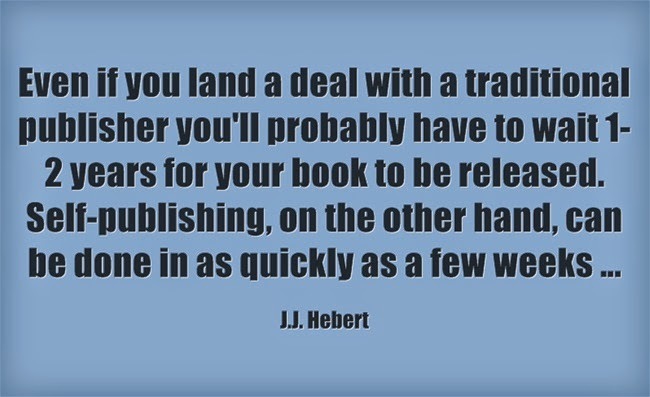 Even if you land a deal with a traditional publisher you'll probably have to wait 1-2 years for your book to be released. Self-publishing, on the other hand, can be done in as quickly as a few weeks -- or if you're really serious and want to take advantage of professional self-publishing services you're looking at about 30-90 days to the launch. One more fact that originally attracted me to self-publishing is that you get to keep your publishing rights. With a traditional contract, you essentially give away your publishing rights by signing an exclusive contract with the publisher. For the duration of your contract you won't be in control and you won't be able to publish anywhere else. If the book doesn't do well in the market you'll basically need to wait for the contract to expire before you're able to seek publishing alternatives. The final example of self-publishing superiority is in the profits. You might see 10% royalties from a traditional book publisher, while self-publishing, depending on the scheme you choose, could put 100% royalties in your pocket. So that's self-publishing in a nutshell -- not everything there is to know about self-publishing but instead a brief overview that should prove helpful.